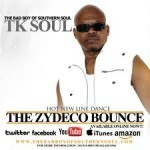 I just reviewed the music video “The Zydeco Bounce”. Zydeco music is a type of music that is a mix between Creole and Cajun music that comes from the bayou of Louisiana. After listening to the song several times, I came away with a very pleased feeling about it. The same kind of feeling you would get listening to the Cupid Shuffle or the Wobble. I feel that this song is a great inspiration for Louisiana, in terms of the entire trauma they have been through from Hurricane Katrina. I see it as a great theme song for all of their colleges, Tulane and LSU. I also see it as an amazing wedding party song as the steps are very easy to learn and all of the energy it has. I would give this song a positive review because it is very catchy. My one concern for this artist, TK Soul, is that this song could be a One Hit Wonder. On a whole I enjoyed listening to this song very much.